News accounts of preparations and stories on contestants continued daily in Hawaii, until the race was completed and for days afterwards. Honolulu was afire with interest. 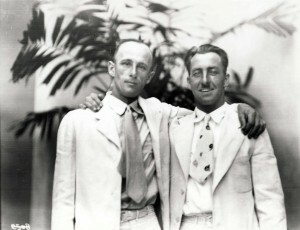 Contestants included two from Hawaii, popular Martin Jensen and Harvey Lemeke (who bowed out later). With his wife’s active campaigning, the ALOHA came under Jensen’s control. A Breese monoplane, it was christened with a bottle of Waikiki water in a splendidly Hawaiian manner, complete with Hawaiian singers and hula dancers. Miss Ruby Smith, an Oakland beauty queen, broke the bottle amidst Hawaiian strains and dances. Jensen was particularly proud of the painted Hawaiian flower lei which draped comfortably around the plane’s nose. MAJOR LIVINGSTON J. IRVING, Breese monoplane of the land type, 260 sq. ft. , 17.9 pounds, Wright J5C engine, 350 gallons. When the WOOLAROC became airborne on the flight, amidst cheers from about 200,000 people, Goebel flew over San Francisco’s Market Street at 1,500 feet altitude. Accompanying photographic and newspaper planes (including one flown by Charles Stoffer) left when they swung into course for Wheeler Field on the island of Hawaii. Search efforts for the three airplanes continued but they were never found. Two planes out of five made it safely to Hawaii. Eleven lives were lost. The long-awaited passenger and freight service between Hawaii and the mainland appeared farther away than ever. Interisland service appeared likely, however, if numbers of passengers and cargo capacity could be increased and made economically favorable.